What Does Code P2100 Mean? OBD II fault code P2100 is a generic code that is defined as “Throttle Actuator Control (TAC)- Motor Control Circuit”, or sometimes as “Throttle Actuator Control (TAC) Motor Control Circuit- Open”, and is set when the PCM (Powertrain Control Module) detects an open circuit in the control system of the throttle actuator motor’s control circuit(s). Note that this code only applies to applications that use drive-by-wire throttle control systems in which there is no physical connection such as a control cable between the throttle pedal and the throttle body/plate. Drive-by-wire throttle control systems are fairly complex systems that use input data from the throttle position sensor to activate a DC motor to control the opening and closing of the throttle plate. In practice, the reference voltage that is supplied to the throttle pedal position sensor changes depending on the position of the sensor, and the PCM uses these changes and input data from other engine sensors to calculate an appropriate throttle opening, which is monitored by a dedicated throttle plate position sensor. As a practical matter, when the engine is running and the throttle pedal is in the rest position, the PCM will open the throttle plate just enough to allow stable idling. As the throttle pedal is depressed, the current from the pedal position sensor changes and the PCM uses this information to command the throttle actuator motor to create a bigger throttle opening, which it will maintain unless the driver presses down further on the throttle pedal. If the driver removes all pressure from the throttle pedal, the voltage from this sensor changes again, but in the opposite direction, which has the effect of closing the throttle (via the throttle control motor) to a minimum opening to maintain the engines’ idling speed. It should be noted though the PCM monitors several parameters continuously during throttle/engine operation. These include, but are not limited to the correlation between the actual and desired positions of the throttle plate and the throttle pedal position sensor, the correlation between the engine speed and the actual throttle opening, and all voltages and currents in the throttle control system. Thus, if the PCM detects a malfunction such as an open circuit in the throttle control actuator motor’s control circuit(s), it recognizes that it cannot control the throttle effectively, and it will set P2100 and illuminate a warning light as a result. Note that on many applications, this type of failure may cause the PCM to initiate a fail-safe or limp mode as a safety precaution, and that the fail-safe condition will persist until the fault is corrected, and the code is cleared with a scan tool. Where is the P2100 sensor located? The image above shows a throttle body and throttle control motor from a GM application, with the motor being contained in the black plastic cover that is attached to the throttle body. 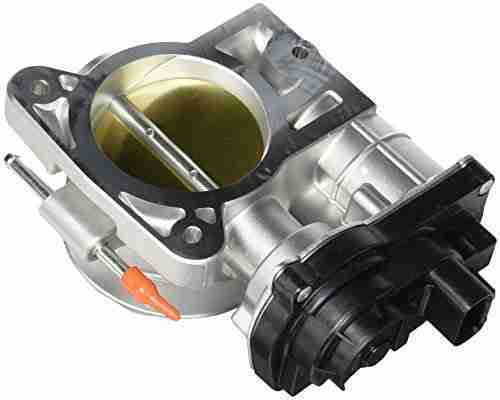 Note that while the appearance/design of throttle control motors/throttle body combinations varies greatly, the actuator motor will always be located directly on the throttle body, as shown here. What are the common causes of code P2100?